With 167 producing completed cow records, the Hoard’s Dairyman Farm earned the 2016 Commercial Herd Award from the American Guernsey Association (AGA). The herd averaged 22,138 pounds of milk 4.7 percent butterfat, 1,030 pounds of butterfat, 3.54 percent protein, and 781 pounds of protein. That converts to 26,551 pounds of milk on an energy corrected milk scale, which is the basis of the award. What do those production levels really mean to consumers? Guernsey milk is valuable for cheese. That being the case, those production figures convert to 2,670 pounds of cheese. Yes, each cow at the Hoard’s Dairyman farm each produced well over a ton of cheese. And their milk indeed goes to make cheese, World Champion Muenster and Brick, as well as Asadero, Quesadilla, and Apple Jack to be more precise. To be eligible for the Commercial Herd recognition, Guernsey herds must have 50 lactations completed during the year. The 167 records included in the Hoard’s Dairyman Farm entry was for completed lactations. At the present moment, there are 417 Guernseys on the dairy. Longevity is a goal of all producers. Having cows continue to make top production records year after year benefits the bottom line when they are profitable for multiple lactations. Additionally, more offspring can then be born from these top cows. Of the top 10 living lifetime milk and fat production cows of the Guernsey breed, half are owned by the Hoard’s Dairyman Farm. An additional cow joins the list for protein, making six of the 10 living Guernsey cows for lifetime protein production at the Hoard’s Dairyman Farm. Two of the cows are classified Excellent, while the remainder are Very Good. Dairyman Storm Bonella is classified VG-88 and ranks third for milk and fat, and second for protein with 234,665 pounds of milk, 11,149 pounds of fat, and 8,532 pounds of protein. Her herdmate, Idle Gold Pdl Anndi, is also one of the four living Guernsey cows in the U.S. over 200,000 pounds of milk. Anndi is classified Excellent and ranks fourth for milk, second for fat, and fourth for lifetime protein. In other AGA honors, the farm also was took second place among every Guernsey herd in the nation, for herd milk, fat, and protein levels. Topping those three categories was Julie (Orchard) Bacon’s Guern-Z Meadows herd with 23,871 pounds of milk, 1,085 pounds of fat, and 807 pounds of protein. Hoard’s Dairyman again tops the list of herds with the most Component Queens. Forty-three of the top 100 combined fat and protein Guernsey cows in the nation call Fort Atkinson home. 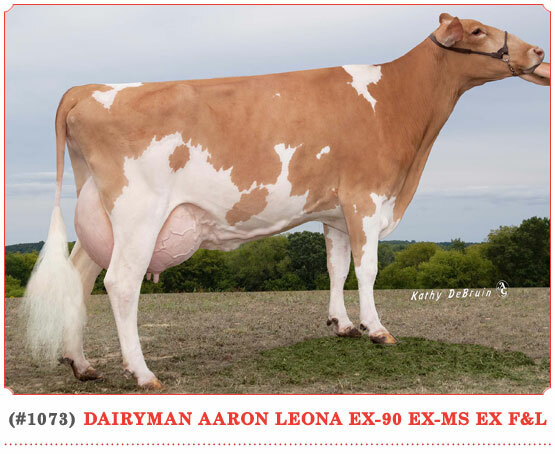 Dairyman Aaron Leona (7th); Dairyman Double L Halo (14th); Dairyman Kringle Rows (16th); Dairyman Latte Eaglet (17th); Dairyman Mint Rosilind (21st); Dairyman Lexus Smarts (22nd); Dairyman Kaptain Begonia (24th); and Dairyman Judgment Moo (25th) all rank in the top quarter of the list. What is a Component Queen, you might ask? That award recognizes the nation’s top 100 cows for combined fat and protein. Think cheese yield once again. Other than pure production, the Hoard’s Dairyman Farm ranks high for Cow Performance Index (CPI), the genetic ranking for the Guernsey breed. The farm’s 260 cows averaged 27 CPI, tying them for the 18th position on the Top CPI Herds List. The CPI value is a predictor of a cow’s or heifer’s genetic potential. Jason Yurs, Hoard’s Dairyman Farm manager, will attend the National Guernsey Convention next week in New York to be publicly recognized for the success of the Hoard’s Dairyman Farm’s breeding program.